And a microwave oven was installed. This is my first-ever wall-mounted microwave! I feel like Thoroughly Modern Millie. Head Honcho Mark Wagner equipped my trusty old work-station with two electrical outlets (one on each side). Mark also honored my request to arrange the electric line so that I can safely re-position the station as needed for food photography and videos without fear of breaking the attached electrical wires. 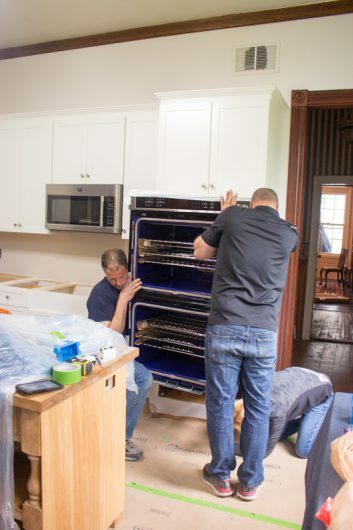 Then came the double wall ovens! These, too, are a first for me. And here again, Mark honored my special request: to raise the ovens so that the top window is centered, more or less, at my eye-level. Oh. The ovens are terrifically heavy. Installing them required 2 men and 1 woman. The woman is Mark Wagner’s wife, Margaret. I would have helped, too, but I was afraid I’d spill my martini. I gave both ovens a trial-run last night, and they heated to temperature very quickly. The oven fans — at least at the non-convection setting — were no louder than a whisper. Also installed was the new gas cook-top. I selected this model because its control knobs are located on the side. Front knobs can be dangerous when you live with a counter-surfing pooch. 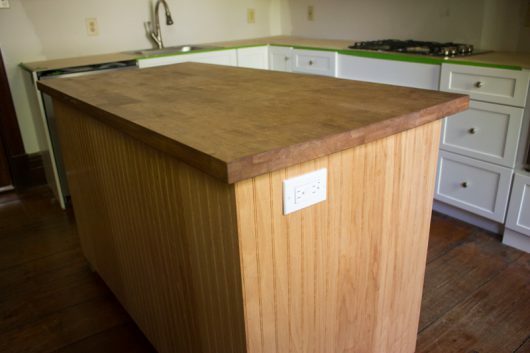 And a plywood counter top. True, it’s a thin counter, but I’m happy to have it. The Lyra quartz counter will be templated on May 17, and installed — I hope — the following week. Thanks so much for keeping me company during this kitchen upheaval update. Your comments mean the world to me! Your kitchen is looking beautiful and well thought out. 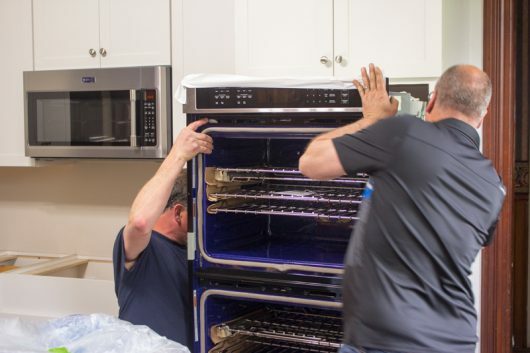 The ovens are in! How exciting. <3 the pooch! Hang in there! It's all looking good! The stars have aligned!! It moving at a great pace!! Reliable contractors are truly a blessing!! I am seriously impressed with how quickly those contractors have accomplished all of that. Looks wonderful. Everything looks wonderful. It looks like all went well and without any hiccups! It’s a beautiful kitchen. It’s looking terrific, Kevin. And your martini comment made me laugh. So very bright and cheery, I went from dark wood to light a couple of years ago and I love it. Happy cooking! I redid my kitchen a few years ago — all the pain and agony is worth the trip! What you are doing looks absolutely beautiful and so well planned…. So exciting! I have loved watching your kitchen evolve. Thank you for sharing. Do I assume your cupboards are from Lowe’s? Very nice. I’m jealous! We started our kitchen on the same day, and after week 1, all I got to show is a leveled floor, ready for new tile. (There was a gaping hole looking into the basement as late as Thursday, so I guess I should feel lucky). Your new kitchen looks great! Love the countertop. Very nice Kevin! So after your call-out for help on ovens, which Brand did you choose? 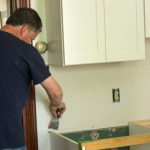 Hi John – Good luck with your kitchen reno! Hi Donna – After studying the reviews from my readers, and after checking the ratings at Consumer Reports.org, I purchased KitchenAid double wall ovens. Martini comment made me laugh. 🙂 Have you decided what treatment for the backsplash? As for the color of the wall, blue keeps coming to mind. So nice to have a new kitchen. Looks wonderful. Good choice on changing the counter top pattern. I doubt if you could have located a spill on the first one. This look so daunting that I will not attempt it again. I did one (minor compared to yours) when I first got the house, 1911 two story. I’m still happy with my choices and I opted to strip and paint all the cabinets white. Looks great!!! And wow, one week. My last kitchen reno was 3 months. Those almond outlets need to be white now. Every older home we buy my husband changes out every switch or outlet if it is not white, but I agree the almond just looks dirty. Kevin, How long do the oven fans run after turning off the heat? P.S. Are the fans whisper quiet in the kitchen or in whichever room you happen to be when they are running? Love, love. LOVE what you are doing. Nothing over the top, and no “tile backsplash!” — or worse, “stone,” which is monstrous to clean. The quartz you chose is perfect, and so much more practical than marble or granite. Your design shows so much respect for the house, it’s character, its age. The cabinets are perfect. Your appliances are good and you will soon have a kitchen that WORKS, is attractive and inviting. Good on ya! Cannot wait to see the wonders you will create in the new happy space. It’s time to remodel my kitchen. I did it over 20 years ago and I think every 20 years is a must. Your project has inspired me, provided great ideas, and raised the bar on remodel scheduling. Don’t know where you found your fabulous building team but I want them!! I can live in rubble and eat takeout for 4 days. You will LOVE a white kitchen. It’s so much brighter and easier to keep really clean. Your colorful utensils will really shine now. Very nice Kevin!!!! Can’t wait to see it when finished!! Can I come cook in your new kitchen with you? Gorgeous reno! Pup will still be able to reach at least the first range knob. Trust me on that. I keep all of my range knobs in a close-by drawer after I came home to a large gas flame burning (thankfully no injuries or damage). 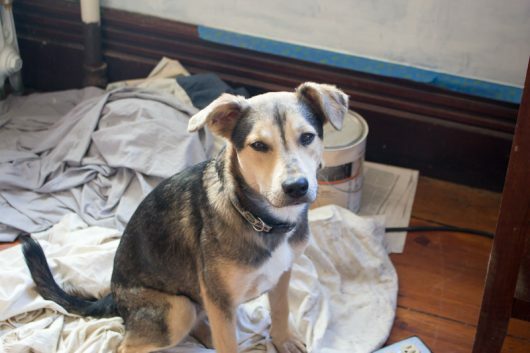 Love your redo and your concern for your four-legged family members! I looked into a kitchen redo, but after pricing cabinets and countertops I decided to paint my old ones, add new knobs and invest in marijuana stock instead! Hoping to make enough off my new investment to redo my kitchen and have some left for that martini you enjoyed! All the best! I noticed you used a lot of drawers on the stove side rather than the traditional cabinets. You will LOVE them and hug yourself every time you use them. Three years ago I found out my cat was using front placed gas stove knobs as a walkway to the other side of the stove after my son told me a burner was on one morning when he got up. This happened twice and we had no idea why, until we caught her taking a stroll on the knobs. Kinda disconcerting to know a small kitty could turn the knobs by just walking on them. So, to keep the cat from burning the house down, I bought Safety First Clear View Knob Covers from Amazon. They’re less than $9.00 for a set of five. They’re one of the best purchases I’ve ever made. Very easy to use and they “spin” if a child (or mischievous pet) comes in contact with them. They’re clear, so don’t stick out like a sore thumb, dishwasher safe and we no longer have to remove the stove knobs. It looks beautiful and in harmony with the age of your beautiful home. I’m so glad you changed the countertops. I think your current choice will be easier to care for and much more in character with the house. The other was too “busy” and just didn’t seem to complement anything! 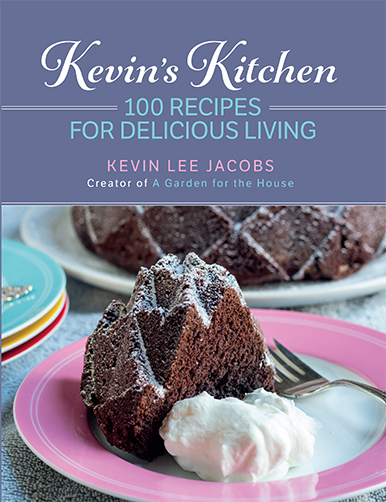 Happy cooking Kevin!!! Congratulations! The end is in sight! 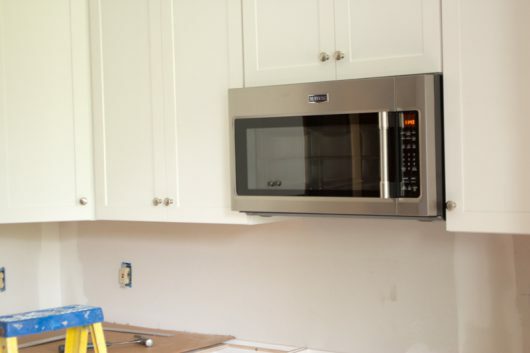 You will love having 2 wall ovens, and your new microwave…you’ll love it all! Looking forward to seeing your first video…. Curious about no backsplash though. 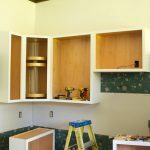 I have just paint and am eager to install a backsplash for looks and ease of cleaning. You think I’m wrong? I so envy your gas stove! We had one when we lived in England but where we live in Florida in a deed restricted community we can only have gas if the tank is underground which is hugely expensive. We opted for an induction stovetop which is better than electric in that when it’s turned off or down it does just that right away, but it’s still not the same. Looking forward to the finished product, which, amazingly, doesn’t appear to be far off – what a crew! P.S. My husband surprised me with some fabulous outlet covers which he found on line; they are European in design; i.e. the Eiffel Tower, different wine bottles, etc. You can find them on line at Switch Plate Gallery – I think they would add just the right touch to your kitchen walls – please check it out! You’ve been so calm during all that hub-hub. The martinis must have helped. It’s absolutely beautiful! Such a beautiful kitchen for a well-deserving man! So looking forward to seeing you bustling about in this space…sipping that libation! such fun following along. the counters will be fabbo, I am sure! I am only 5’1″ so I have always been leery about the microwave so far over my head, I couldn’t check on something, without first removing it! Then, the idea that I am blindly trying to remove something that might be bubbly and hot over my head has scared me away from installation in the cabinets. I also couldn’t stir something ‘up’ there. Yours look wonderful and I wish I felt comfortable doing that!! WOW looking great! Of course the old was nice too. It is nice to have up to date things so much better! I love renovations so thank you for sharing yours. It is looking wonderful: fresh, neat, and in keeping with the house. Look forward to seeing the counter tops. Sweet puppy. They bring such joy to our lives. Wow! Order out of chaos in a very short time. I know it doesn’t feel that way when you’re the one living with it. Love everything you’ve done, and can’t wait to see the new counter top when it’s in. Loving your all white kitchen and great thinking with your final choice for counter tops. I think you should go ahead and “complete” the kitchen with a neutral backsplash. 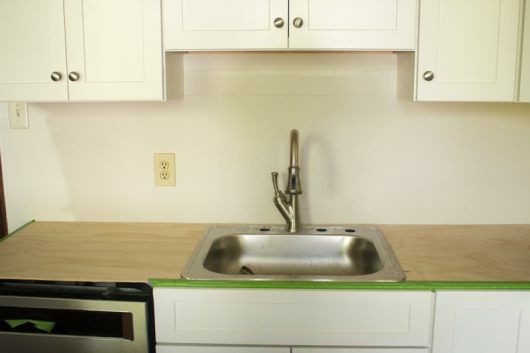 My recommendation would be to use the same material and color that you are using for the countertops. The slab would eliminate having to decide on tile material, tile size, tile color, or tile pattern. You will be trading slab cost for detail labor cost of installing piecemeal tiles. The slab material is so classy and will be the easiest to clean all the gunk that always accumulates behind the sink and stove backsplash areas. 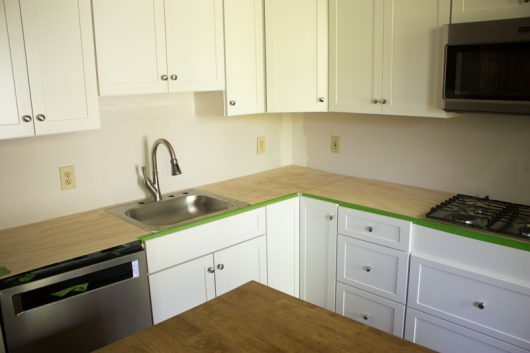 Why go to all the trouble of updating a kitchen and then leave the backsplash undone and just looking painted like a barebones track home kitchen? 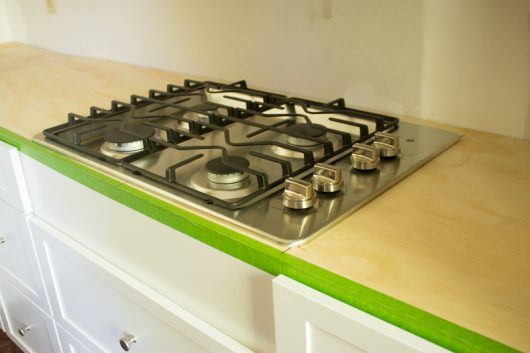 Backsplashes have been used since the early half of the 19th century. You need a beautiful backsplash backdrop for yourself and your videos. 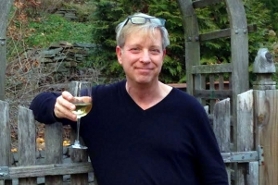 Kevin, I love reading this blog; I just redid my kitchen and love it now that it is finished. 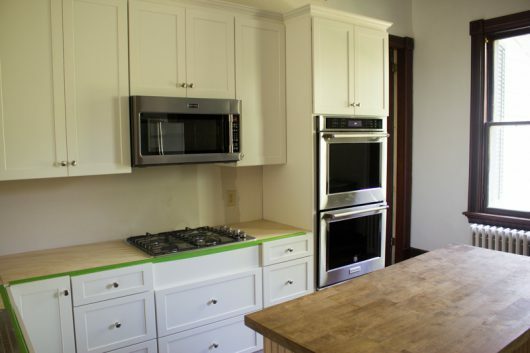 My favorite new addition: double ovens at eye level; enjoy! Putting everything back into different cabinets with a different configuration will be the difficult part for you, Kevin. Everything has to be thought out regarding which cabinet or drawer will serve you best for using that item. Somehow I missed the part where the kitchen sink will be. I thought it was going to be by the windows so you can look out while using the sink. Personally, I do not like having a sink on a full wall with no window to look out. I thought the same thing about the island as Kathy Sandel…it looks old and out of place now. Any plans to update it with white paint and a new top? It looks really nice, great choices. I love drawers over cabinets for most kitchen storage. Roll out shelves are great also. What is the floor going to be? Is it already down? Dear Kevin, I really love your kitchen and fun comments . We recently moved into a newly built house but I designed my own kitchen. All white, plenty of cupboards and wonderful big soft close drawers for plates and mugs and pots and pans. My counter top is very similar to what you chose and I got a glass splash back in grey matching the ” marble ” of the counter top. . All very easy to clean. You will love cooking in your new kitchen! Very exciting !! Well done. PS…. I also love the way you have thought of your ” fur babies” to keep them safe and as happy as possible during this time of up heavel for them . Not enough people think of that. Perfect! I so love your choice of cabinet doors and hardware; simple, clean lines. So many kitchens these days have such overdone cheezy door designs and those awful (imo) black counters–Cheese is for tasting, chewing and swallowing not for elements of interior design :). Your design is right after my own heart; white is the best color–so reflective and bright. And as one of your friends wrote; it’s easy to keep looking clean and appetizing for food prep. I’m thankful that you chose the best situation for your martini. Smart man. Hi Kevin, Your kitchen is looking great. I like your final choice of countertops much better than the first. The first was too busy looking. We remodeled our kitchen several years ago and it’s worth all the inconvenience you go through when it’s all done. My husband built our cabinets and I did the finishing on them and I installed a black slate floor as well. You are lucky to have a working sink. I didn’t and did all my dishes in the bathtub. I know you will have a great time cooking in your new kitchen. Love your new kitchen. I would be a little wary of putting the microwave over the range though, being the clumsy person that I am. I went through this 5 years ago. I’m nowhere near the cook you are, but I had 25 years experience and very definite ideas. I was able to stick to them, mostly. The one thing I bent on was the sink. Darn it. Wishing you a great outcome, Kevin. Even though I did like your first choice for the countertops, I like the final choice even better! I just noticed that the front to the cooktop looks like it is missing the front piece. 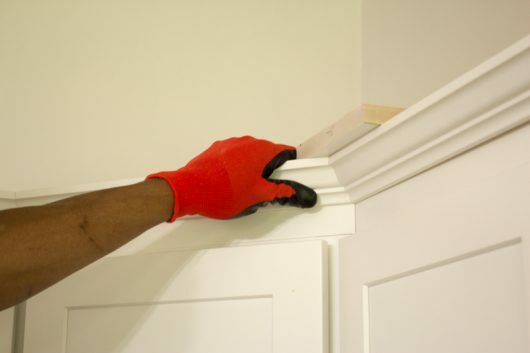 Are you having a fake drawer panel installed? I am impressed with all that was accomplished by the work crew in such a short period of time. Thank you for sharing the progress with all of us! Kevin, lucky you! Good job, to say the least. But, UGH. I missed WHICH oven AND stove top brand and models you went with. I’m in the process as well and want to check your choices out. Can you let me know when you get a breather? Hi Kevin, I’m also dreaming about a kitchen remodel with many of the same elements as yours: double electric wall oven, gas cooktop, new white cabinets and counters, more and better lighting, etc. I noticed that the microwave is mounted directly above the gas cooktop. Is there any concern or accommodation for a heat source below a microwave? And also, does the cooktop not need a range/vent hood above it? If not, that expands options in my future kitchen remodel. Things are looking great in the kitchen, Kevin. I can just imagine how excited you must be to have it all coming together just the way you’ll love it. We’ll all be delighted to see the counters in and see you cooking there! I’m sitting at work wishing I were at home doing some fun projects, until then I read your posts out to my coworker and we just laugh and laugh!! Thanks for that laughter and the pics of Avery! Looks great. You will love the double ovens and gas cooktop! “and a woman.” hysterical. And you with your martini. So excited for your new workspace! Beautiful. But I have to ask. Where are you going to put your beautiful African violets? Avery says she wouldn’t do such a thing as counter surf. She’s blaming her cat siblings. I agree with Tammy, you also had me laughing at the martini comment = ) That was good thinking to get a gas cook top with knobs on the side, since your adorable pooch likes to look for goodies up on the counters. How cute your counter surfing pooch is in the photo. I’m happy that everything is going so well with your kitchen renovation. Would love to borrow your team of hard working contractors to give my kitchen a much needed face lift. Did Lowes create that Hepa filter temporary “door”? That’s really wonderful to keep the dust at bay. Laughed out loud at what you wrote about the photo of the crew, which is a great pic. Lowes should use it. Looking forward to seeing pics when the kitchen is completely done! Would you explain your oven system..are they both electric, convection and fan assisted? The transformation is startling and I’ve been enjoying following the progress. Must admit, my favorite photos are those showing your precious pup. Keep it all coming. Each image is saturated with excitement! What a wonderful project and like PennDot says about its perpetual roadwork here in PA … “Temporary Inconvenience for Permanent Improvement”. Looks really nice and functional. I was without my countertop for about a week too. The plywood worked well for the short run. So happy for you. A new kitchen is an amazing lift to the spirits. May you make many memorable meals and have much joy. Can’t wait to see the finished product! It looks amazing….love the crown moulding…adds a classic finish. Thanks for sharing your kitchen renovation. So many choices. I’ll be following to watch what you decide for the backsplash. I redid my kitchen a couple of years ago but so far have no backsplash other than white wall as I didn’t find a tile I liked, don’t like the look of solid surface to match my synthetic quartz countertop and have just decided not to think about this large detail. Certainly does not impact the use of the kitchen. Maybe I’ll research Julia Child’s pegboard backsplash as a solution. Kevin, I believe you’re teasing us! I have been checking in every day in hopes of seeing the final product. I’ll be patient. Thank you for your wonderful website, it’s given me so much pleasure. Kevin, I ADORE your blog and your writing. I just snorted reading the bit about not helping because you’d spill your martini! I’m still laughing! 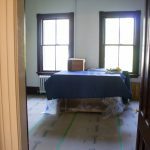 I myself am moving back to the East Coast after a 20 year stint in Seattle, and I’m debating on whether or not to embark on restoring an old house (with two small kids in tow!) or just getting a plain old box to live in. I like to make things difficult, so I’m secretly hoping we find a fixer. We haven’t bought the house yet (still looking), and, thus far, my marriage is still in tact. We’ll see how it goes after we knock down a wall or two. Thanks for keeping us on the edge of our seats with your remodel. And thanks for continuing to make me laugh!